Save more than 300 hours a year and thousands of dollars. 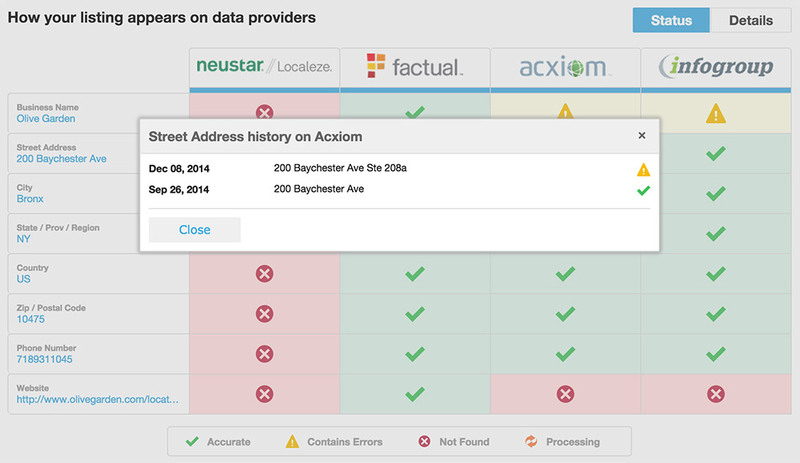 Listing Distribution submits business listings to all four major data providers: Factual, Acxiom, Infogroup and Neustar (Localeze). These data providers are referenced by over 300 online listing directories and disseminate business info all over the web. Consider Vendasta’s data analysis of 100,000 business locations: the average business has 68 online listings, and 41% of those listings have an inaccurate address. Furthermore, these businesses have an average of three different phone numbers across all of their listings. Local businesses need your help, and they need it soon. As much as listings management is a challenge for small businesses, it is an opportunity for digital agencies to help these businesses while increasing their own revenues. If your agency is providing local listing management services to SMBs, you have to be able to show whether or not the service is working to keep clients happy and earn renewals. That’s the Vendasta advantage. We partnered with all of the four major listing data providers — Factual, Acxiom, Infogroup and Neustar (Localeze) — in order to offer a complete listing syndication solution. To correct a company listing with each of these providers individually is time-consuming and expensive. With Vendasta’s Listing Distribution, all it takes is a small annual fee.